A service that helps prevent homelessness in west Cheshire and supports some of the area’s most vulnerable people has been running for six months today - World Homeless Day (10 October 2018). Since launching in April, the Forfutures team has helped close to 80 people that had been sleeping rough into direct access accommodation, and nearly 50 people have moved from direct access into support housing. Almost 118 people have been enabled to move from supported housing into independent living, with over 480 people receiving support to prevent them from becoming homeless. Forfutures, which runs the service on behalf of Cheshire West and Chester Council, supports those who are at risk of being homeless, those without secure accommodation or ‘sofa surfing’, and people sleeping rough. 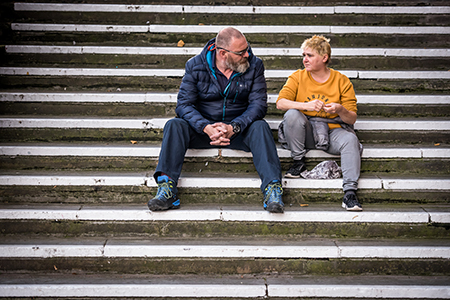 Di was supported by Forfutures after she was referred to the team after finding herself homeless and sleeping rough in churchyards. Janet Lawton, strategic homeless lead at Forfutures, said: “We have made great progress over the past six months, creating a more joined-up service across west Cheshire, introducing new approaches and increasing the availability of our services. “It is fitting to mark World Homeless Day by looking back on everything the team, our partners and volunteers have achieved in helping people like Di. Councillor Angela Claydon, Cabinet Member for Housing, said: “It is the statutory duty of the Council to ensure people who are homeless or at risk of facing homelessness are supported to find accommodation. Once someone has been given accommodation, it is important that they continue to receive emotional and social support. Forfutures recently brought together partners from across the borough at Storyhouse in Chester to reflect on achievements made in its first six months and to consider how to continue to improve homeless support services in the area. The 75-person strong Forfutures team has introduced a range of new approaches to support people into safe, secure housing and provide them with opportunities to build more positive and sustainable futures. This includes a revised street outreach service, mediation services, health and wellbeing support and four hubs offering immediate advice and information about housing options. Forfutures have been supported with this by a whole range of different organisations, from statutory services to charities and faith groups across the borough. In its first six months, 95 people have received outreach support to move indoors from the street; 220 people are receiving support to prevent them from losing their home and a further 280 people have accessed immediate advice or information at one of the Forfutures hubs. If you are concerned about becoming homeless yourself or are worried about somebody else you can visit www.forfutures.co.uk for more information or contact the organisation by phone or email. Members of the public who are concerned about someone sleeping rough can call the 24-hour number 0300 123 2442 (option 4) to let the forfutures Outreach team know.